When Ali Edwards announced the most recent dates for her Week in the Life project, I thought I might finally give it a try. She had chosen July 25 through July 31 to document, so I figured that starting on my birthday and documenting that week would be fun. I started out on Monday taking photos and keeping notes about our day, then continued on Tuesday. However, by Wednesday I realized I wasn't really enjoying the photo taking and documenting all that much. Since my scrapbooking philosophy revolves around having fun and enjoying the process, I decided not to continue the project. Nevertheless, I did have some fairly good "everyday" type photos from those first few days - photos that I hadn't taken before. 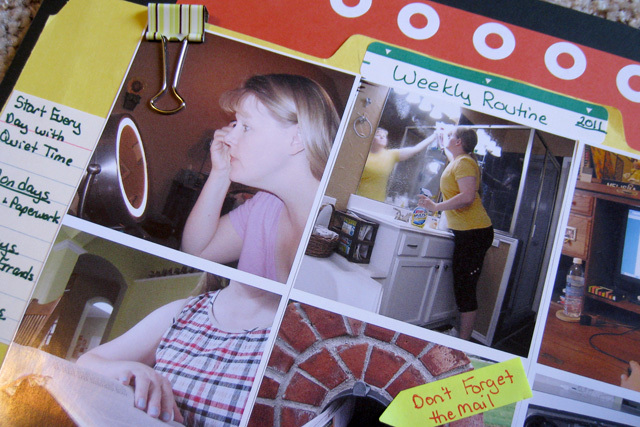 I also realized that I had not documented my weekly routine, and even though it changes occasionally, I've been doing the same things on the same day of the week for a couple of years now. I decided to use a few more office supplies on this layout since they are part of our everyday life. I cut a file folder in half to make the yellow background and added white hole reinforcements for a border along the red cardstock. I used index cards for journaling along with an arrow post-it note. I added a cute binder clip and over sized paper clip to hold it all together. who said: What a fun idea! I bet I could scrap a page about TTO at the Language Olympiad with some nifty office supplies. Congratulations Sian! I have your address and will be putting a package in the mail to you this week! Your not alone. I started the WIL project too and didn't really finish it. I have completed twice, but this time it was just really hard for me to keep it up. I'm going to look through what I have and see if I can put a week together my own way. I like the layout you did. Years from now it will be fun to look back on what things are the same and what is different. I think that whatever you get out or WITL is great. I love the color combo in your layout. Good for you for abandoning a project that was not meeting your scrapping goals! 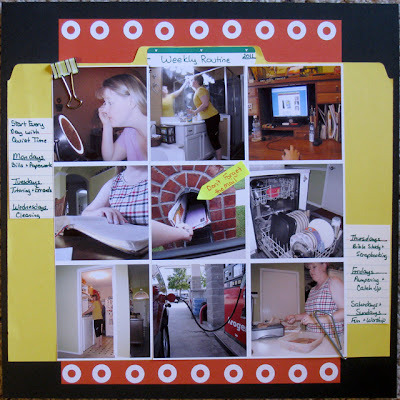 Love your grid of photos and the use of office supplies to document everyday life makes so much sense!